‘Hunnie’ ('them' in local slang) is a collaboration project between Henriëtte Waal and Sophie Krier, which addresses our approach to nature ‘now that cows and greenhouses are disappearing from the landscape’. In the course of a years field work new forms of recreation and maintenance in De Bovenlanden in the Dutch Province of Utrecht were designed and tested. The area, known as a polder, was destined to exchange its agricultural function for a nature reserve in the context of a European wide plan to link ecological zones and allow flora and fauna to migrate and diversify. Hunnie's focus is the role of humans in relation to this man-made 'new nature'. The initiators invested time into acquainting themselves with inhabitants and local clubs with very specific knowledge of the area. Fishermen; hunters; historians; geologists; biologists; dieticians; artists; water engineers were given the role of guides, while scientists and thinkers were asked to provide a reflective framework. New nature lovers from the surrounding cities were attracted through a series of seasonal adventures, products and a field workshop related to water, clay, grass, fauna, wilderness and willow. Because Project Hunnie ran ahead of the Provincial realisation plans for ‘new nature’ it was possible to implement insights from Hunnie’s fieldwork into the decision-making process. 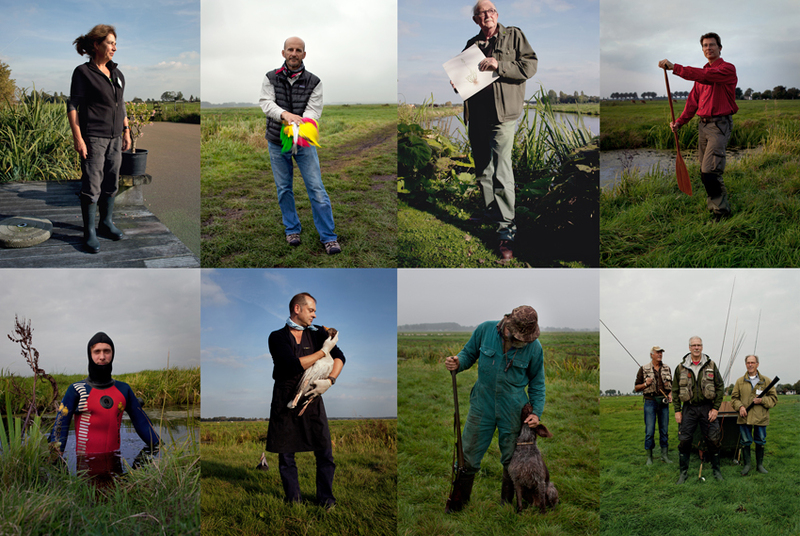 Explore, appoint and visualise the current natural and cultural potential of De Bovenlanden. Design and test new forms of nature experience and nature maintenance. Address the urgency of new exploitation models for ‘nature’ in the Netherlands with policy makers. Challenge ideas around the role of users and maintenance issues. Empower entrepreneurs and nature volunteers making them more visible in the transformation process of De Bovenlanden from a rural area into a new nature resort. Equip participants with skills and knowledge of their surroundings. Characteristic guided walks to explore and imagine today's potential of De Bovenlanden. Linking the wisdom inherent in local activities to expertise in art and science. The knowledge that is released is then processed in custom made attributes for the future visitors of the area. Specially designed outdoor equipment. In a farm yard where Hunnie products can be bought or borrowed by visitors. Zorgboerderij Amstelkade icw Hunnie Foundation and Staatsbosheer. nature volunteers, local entrepreneurs and inhabitants, nature lovers from the city, policy makers, scientists, farmers, hunters, fishermen, maintainers etc.